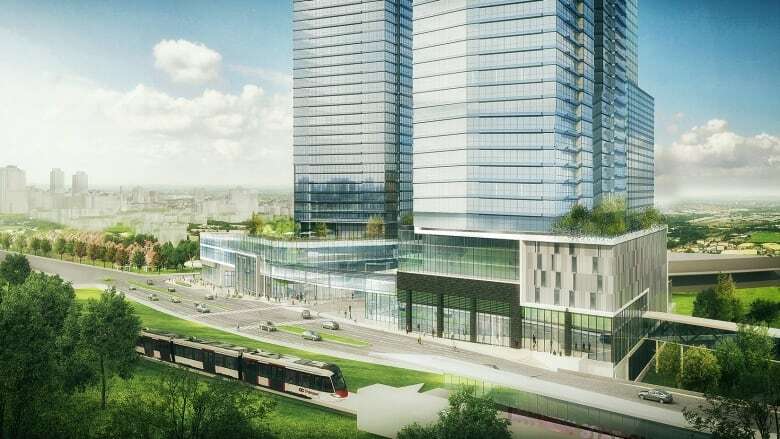 An Ottawa developer is set to receive more than $9 million in incentives from the city in exchange for cleaning up contaminated land across from the Bayview LRT station. Trinity Group plans to build three condo towers rising from 50 to 59 storeys at 900 Albert St. The buildings will contain 1,632 residential units as well as office and retail space. The project qualified for $8,255,397 in brownfield development grants over 10 years to clean up railway contaminants left on the site. In a unanimous vote Tuesday, the city's finance and economic development committee also agreed to waive a $920,000 fee to allow the developer to move municipal pipes that currently lie under the lot onto city land. "This development truly is council's poster child of fulfilling Ottawa's official plan and transit-oriented development goals," said Lee Ann Snedden, director of planning services. According to planning staff the city can expect a $5-million increase in municipal taxes from the development. Staff also lauded the benefits the project will bring to the surrounding neighbourhood. Coun. Catherine McKenney, who represents the area, initially said she would rather wait to waive the fee until the site plan is finished and the city can be sure the developer will follow through on its promises. "We are going to give land away for a million dollars and I would just like to know if in fact the applicant is looking at the public realm and the benefits to the community," she told the committee. The developer has said the pipes need to be moved to facilitate the design of the buildings. The city usually charges market price to allow developers to encroach on its land, but has agreed to waive the fee in this case because the pipes are part of the municipality's infrastructure anyway. "It actually makes sense," said Stephen Willis, general manager of planning. "It's different than if this was private infrastructure going on to the municipal right of way." Mayor Jim Watson said he looks forward to seeing work begin on the site, as well as nearby LeBreton Flats. "These properties have been underdeveloped for years," he said. The decision still needs the approval of city council. Meanwhile the contract to begin moving the pipes has already been awarded. The work will take about eight months.